Armadillo Ale Works generated a fair bit of buzz back in May, when they announced plans had been finalized to build a brewery of their own in Denton. While a spring 2015 opening is still a ways off on the calendar, founders Bobby Mullins and Yianni Arestis are hoping to give fans of the brewery an idea of what they can expect once the new facility debuts next year. The pair admits that the success of Brunch Money had a lot to do with their decision to release a line of limited-edition brews with the aforementioned goal in mind. As Arestis explains, when "customers tell you it's their favorite beer of the year...that gives you the confidence to keep taking risks." Statements like that have reinforced their vision of what they want the brewery to be known for, which is one capable of producing quality brews that are both innovative and unique. Those are words that will most certainly describe the beer they're brewing this weekend, but just in case you'd prefer a different turn of phrase, allow me to suggest 'summertime refresher.' In fact, that was the goal for Armadillo's newest beer from the start. With seasonal temperatures in mind, they decided their next release "would have to be a combination of the most refreshing fruit and the most refreshing type of beer." What instantly came to mind was the idea of making a watermelon kölsch. 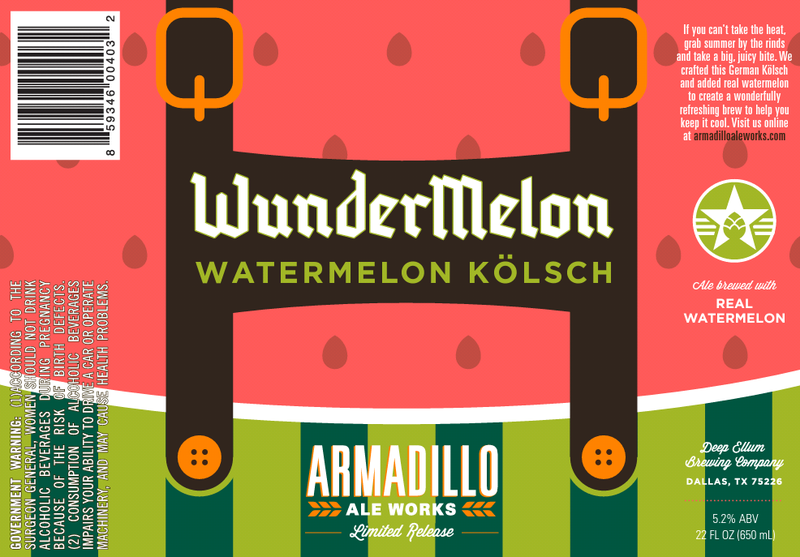 Due out in mid-August, WunderMelon will be a traditional German-style kölsch brewed with malted barley and a touch of wheat. Real watermelon juice will be used to provide the supplemental flavor, and plans are to add it directly to the fermenter. Mullins says that incorporating the fruit later in the brewing cycle should help maintain freshness and make the beer really pop. Test batches, he reveals, have resulted in a "dry and crisp beer, with a slightly tart fruitiness." The fruit juice, moreso than the hops used, lends a hint of bitterness on the back end to help balance the sweetness upfront. Finishing out with a 5.2% ABV and 26 IBU, WunderMelon promises to be a light, easy-drinker, which should make it a great choice for the sure to be sweltering days ahead. At least that's the impression one gets when Arestis says, "I can't think of anything I'd want to drink more on a hot Texas summer day." Also take note that a batch of Brunch Money is rolling out to retail as we speak. As before, though, quantities are limited, meaning stores may sell out quickly. Coming up on their second anniversary, the Cedar Creek Brewery in Seven Points is making changes to the way it does business. Looking to leverage recent revisions to laws regulating breweries in the State of Texas, Cedar Creek announced today that they have switched to a brewpub license, which will allow them to sell packaged beer to the public from this point forward. "In its early days, visitors to Cedar Creek Brewery paid for a tour that included a souvenir glass and free beer samples. As Texas law prohibited breweries from directly taking money for beer to be consumed on-premise, this was common practice in many Texas breweries. In 2013, changes to Texas legislation allowed manufacturing breweries to begin selling beer for on-site consumption, a change that Cedar Creek Brewery took advantage of. A climate-controlled taproom was built that has become a popular hangout for locals and weekenders alike, and has helped foster a real sense of community. Owner Jim Elliott made the decision to change to a brewpub license in early 2014 after numerous requests from customers to buy packaged goods at the brewery. The brewery is currently selling four-packs of its year-round and special release products, with plans to add refillable Party Pigs to the lineup in coming months. With the brewery being so close to Cedar Creek Lake, a popular weekend destination for Dallasites, Elliott anticipates this addition will be a popular, eco-friendly option for craft beer lovers in the lake area." 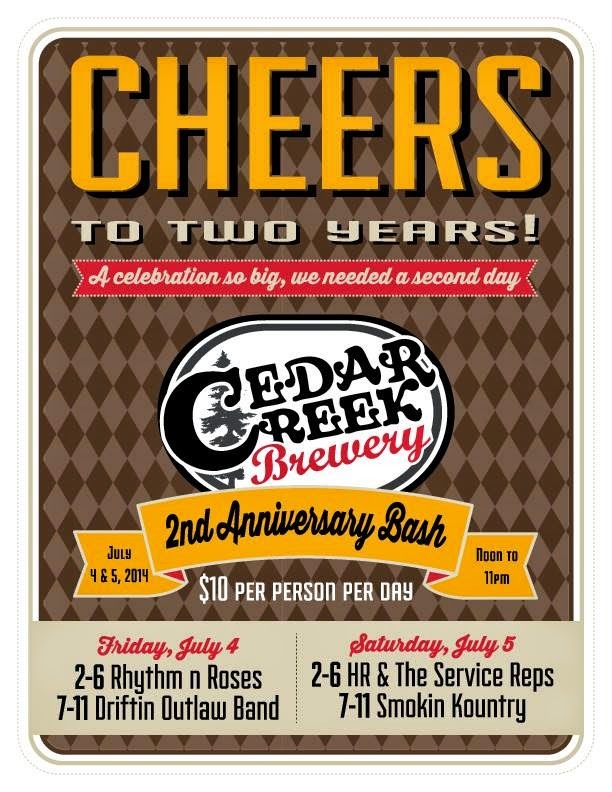 Those looking to pick up Cedar Creek brews to take home can do so this weekend while attending the brewery's 2nd Anniversary Bash. The two-day event, happening Friday and Saturday (July 4-5), will feature food, live music and the return of Cedar Creek's summer seasonal witbier, Repartee.